In his Thirteen Principles of Faith, Maimonides includes the belief that Moshiach will come. "Even if he delays, I will await his coming every day." And for centuries, our people have expressed that belief, hoping and praying for Moshiach's coming. The Rebbe, however, was not speaking about hope and prayer. He was stating that "The world is on the threshold of Redemption." Now these statements seem somewhat difficult to explain. The headlines of any newspaper seem to belie them. On the other hand, the Rebbe was the furthest thing from a hypist. His message was always realistic, if on occasion, several years ahead of the times. And so, rather than dismiss his statements, many people began to ask themselves and contemplate: What did the Rebbe mean? As indicated by his subsequent talks,3 it is possible to say that his intent was that the trends that will characterize the era of Redemption are already at work in the world at large. To explain: It has become almost a cliche to say that our society is undergoing a transition of enormous scope as radical, discontinuous changes are causing the existing frameworks of technology, economics, education, and politics to give way to new definitions. As we survey the changing horizons of contemporary life, it is possible to recognize certain patterns in process. These patterns, it can be argued, parallel and are precursors of the trends that will characterize the era of Moshiach. By no means is our world Messianic at present. On the other hand, many of the motifs that will distinguish the era of the Redemption can already be recognized in our contemporary society. In that age, there will be neither famine nor war, neither envy nor competition, for good things will flow in abundance and all the delights will be as freely available as dust. The occupation of the entire world will be solely to know G‑d.... "The world will be filled with the knowledge of G‑d as the waters cover the ocean bed" (Isaiah 11:9; Mishneh Torah, Laws of Kings 12:5). Lets look at these prophecies one by one. "There will be no famine." In the early 1990s the world produced more than enough food for the 5.3 billion people on the planet, and it was probably capable of growing enough to feed the significantly larger population projected for the first part of the 21st century. To eliminate famine and reduce malnutrition, however, attention needs to focus not only on food production but also on food distribution, consumption, and family planning. Let me say from the outset that it is my conviction that there is no reason not to have a hunger-free world some time next century. The world will be able to produce enough food for everyone. It already does so, and it could produce more. In other words, the problem is no longer in food production, but in food distribution. Is that not a major paradigm change? In 1900, one third of all Americans worked on farms. By and large, there was no shortage of food, but there was little left over for export. Today, the American population has grown several fold and only 3 % work in agriculture. Nevertheless, this 3 % produce enough food not only to feed the entire population but to export throughout the world. Moreover, this phenomena is not only confined to the US. Breakthroughs in science and technology have enable us to grow crops in deserts, swamps, and other areas where one would never have thought possible. Yes, there are still pockets of starvation in the world today, but that is a factor of sociology, not of agricultural capacity. In previous generations, there was a question whether it was possible to produce enough food to feed all mankind. Today, the question is only: Can we learn to live together harmoniously and distribute the food that we grow? As globalism continues to spread within our society, the age-old afflictions of poverty and famine are about to overturned by tidal waves of innovation in science and commerce. All the while we're getting so economically interconnected, as to make war a lose-lose [proposition].... I think we're moving toward one economy , one single market economy in the world. It will be a long time before we get there, but that is the direction we clearly are going in. Part of that phenomenon is the end of war. What are the chances of there being a war that involves the nations of Asias Pacific Rim, North America, and Western Europe? Almost nil. The stakes are simply too high. A war would destroy the underpinnings of the global economy on which all these countries have begun to rely. In nations like Serbia and Sierra Leone that have not been sufficiently integrated into the worlds economic structure, war is tolerated. For the industrialized nations do not yet realize how such wars damage them. On the contrary, they profit from the arm sales. But within those portions of the global village where cooperation reigns, no one will risk the prosperity that has been created to fight a war. Steadily, the circle of cooperation is widening. The nations of Eastern Europe and South America are joining and the countries further on the periphery are being drawn closer. How far off is the time when all nations will be swept in? Here again, this represents a major paradigm shift. In previous eras, there have been times of peace and detente, but the fundamental climate was one of conflict, for each country was concerned primarily with its nationalistic objectives and operated under the premise that what another country received was to its detriment. Today, nations operate under the conception that their futures are intertwined, and progress by one benefits another. Moreover, the momentum to peace is being propelled by other factors besides economics. As our contemporary media shows us the real horror war wreaks, we are losing our tolerance even for the mini-wars mentioned above. This trend began in Vietnam, the first of the "the living-room wars." Many have suggested that it was seeing the violence on TV that turned many Americans against the war. To prevent a recurrence of that phenomenon, in subsequent conflicts, the military has worked with the media to present an image of war that people can stomach. People are becoming sensitized to the message that war is horrible. In Kosovo, we were so revolted by the atrocities that we felt we had to do something to stop them. The only times our resolve was daunted was when we realized that we were also killing and the victims of our attacks had blood that was as red as our own. The signing of the INF Treaty in 1987 symbolizes the turning point in the superpowers' arms race. The numerous unilateral, bilateral and multilateral disarmament measures signed since then have reawakened an old question in a new international context? How does one convert excess military capacities for civilian use? Admittedly, the realization of this prophecy is a little bit far off, even today. On the other hand, a fundamental message has taken hold within society. The way to achieve wealth is not by grabbing and hoarding, but by sharing. The industrial revolution altered the predatory mode of life that had prevailed for centuries and spawned an economic system that gave men a way of producing wealth in which the good fortune of others multiplied their own. Through collaboration and the division of labor, it became evident that when society as a whole grew and profited, the share of every individual increased. This shift in focus is a by-product of the transition from an industrial to an information society. For when wealth comes from materials, it is hard to deviate from the fundamental conception that the pie is small, and when a piece is given to somebody else, your share is less. Today, by contrast, it is evident that it is knowledge and creativity, not materials, that produce wealth. Statistics bear this out. The weight in tons of U.S. gross domestic product has dropped 25% in the past two decades, while its value has more than doubled. Material resources are clearly not the primary producers of wealth. The concepts are plainly evident on the personal level. Today's millionaires are people with ideas that have benefited others, not yesterday's gold miners, oil tycoons, or factory owners. Now for knowledge to produce growth and tangible benefit, it must flow freely. And this flow of knowledge across peer networks has tumbled the hierarchies and corporate ladders that used to dominate corporations as CEOs were forced to acknowledge—and amply compensate—the superior knowledge of their subordinates. But it is not only that the profits of a corporation are being shared, the fundamental point is that shared efforts and think tanks have become the life-blood of these companies. As opposed to the emphasis on individual effort and entrepreneurship that dominated the past, today's innovations are products of pooled efforts and synergistic environments. Similarly, on a larger scale, the nature of the relationships between corporations has also changed. Instead of slugging it out in the dog-eat-dog competition that prevailed in previous eras, today, we see an emphasis on finding a market niche that enables coexistence. Competitors are sharing technologies and cooperating on projects in the awareness that the advance of all involved parties is the surest way for them to push their own positions forward. This approach has lead to a "virtuous cycle" of continued and growing prosperity, benefiting all members of society. We have discovered that the pie is ever-expanding and the people who receive the largest pieces are the ones who enable more and more others to partake of it. "Good things will flow in abundance and all the delights will be as freely available as dust"
If Maimonides was alive today, hed certainly say that this prophecy has been fulfilled. We—and I'm speaking about the average man, not only the wealthy—are living better than we ever did. Think about things we take for granted: running water and plumbing, electricity, telephones, central heating and air-conditioning. A hundred years ago, in most places in the world, these conditions did not exist or were the province of aristocrats alone. And beyond our living conditions, other fruits of the industrial revolution, including automobiles, air-travel, modern communication and entertainment, have transformed the quality of our lives indescribably. These changes, however, will be multiplied ten-fold in the coming years as the micro-chip and interactive networks transform the nature of our homes and cars. Echelon is already designing a digitalized home where all major appliances are connected to a single computer network. And Delphi is teaching us to look at our cars as a movable entertainment center. These amenities that have filtered through almost all strata of society, giving everyone a taste of "the good life." Beyond this, however, we have recently seen a revolution in the concentration of wealth. Previously wealth was in the hands of a select few. Now, it is spreading to many. Statistically, the numbers of millionaires and billionaires have multiplied tenfold. But whats happening in the middle of the economic totem pole is more significant than whats happening at the top. We have become a nation of shareholders. Your cleaning lady will tell you of the killing she made last year with Qualcom. It has reached the point that the wealth effect of our contemporary economy has become a subject of concern for the Federal Reserve Bank. "The occupation of the entire world will be solely to know G‑d"
There are two implications of this prophecy and both are already at work within our society. First of all, there will be a minimal need for physical work. Man will not have to spend his time and energy working like he does today. Industrial efficiency, smart machines, and robots are already reducing our reliance on human labor. Because of the sociological effects, this development is being deliberately restrained. When—and that when is approaching faster and faster—these restraints are lifted, many of the tasks presently performed by men will be carried out by machines. And we need not go far into the future; even now, the primary aspect of our work is intellectual, not physical. I'm not only speaking of readers of this paper. Throughout contemporary society, we are working with our heads and not our hands. The second point is that the free time will be used to "know G‑d." Again, this is not merely a prophecy for the future, but a dynamic already active in our society. The search for G‑d is considered one of the major trends of the present decade. Approximately one-tenth of America's population professes to be involved in New Age spirituality. When this number is combined with the growth in traditional religious movements, it is obvious that significant portions of our population are seeking spiritual awareness. The expanding power of the religious right and the appeal of the New Agers whom they are trying to squash are flip sides of the same coin. People want to know G‑d. 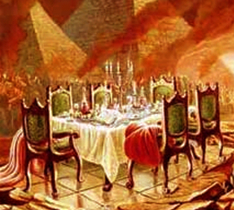 These series of events are not accidental, the Zohar, the fundamental text of Kabbalah, contains a stirring prophecy: "In the 600th year of the sixth millennium, the gates of sublime wisdom will open and the wellsprings of lower wisdom [will burst forth, to] prepare the world to enter the seventh millennium" (Zohar I:117a). The 600th year of the sixth millennium began in 1839. The sublime wisdom refers to the teachings of the Torah and more particularly, to the mystic knowledge of the Kabbalah. "Lower wisdom," refers to secular knowledge, and "the seventh millennium" to the era of the Redemption which like the Sabbath that follows the six ordinary days of the week will be characterized by rest, comfort, and spiritual activity. There is no need to spell out the details of how the Zohar's prophecy is being fulfilled. We are all aware of the sweeping changes that have occurred since 1839, as advances in science and technology, "the bursting forth of lower wisdom," produced the Industrial Revolution, the Information Revolution, and the post-information societies of today. These advances were not self-contained goals. Instead, as mentioned before, they are building the backdrop for the Redemption. Nachmanides, in his Commentary on the opening verses of the Book of Genesis, explains that chronology is not accidental, but part of a pattern paralleling the way the seven days of creation lead to the Sabbath. In that scheme, each day of creation represents a millennium, and the Ramban demonstrates how the events of every millennium parallel the contributions of the corresponding days of creation. According to that conception, in the present age, it's Friday afternoon, past midday. Now in every good Jewish home, at that time, the house begins to look a little Shabbosdik. Similarly, at this time, G‑d's home, the world, is beginning to anticipate the era of the Redemption. Again, we are not saying the world is Messianic today. What we can say is that there are Messianic trends at work in our lives. With or without our realization, the backdrop for the era of peace and prosperity that Moshiach will bring is being created at present. Maimonides tells us to "wait for [Moshiach] every day, that he comes." For generations, the Jews have been waiting. But theres several types of waiting. Once a noted rabbi came to the Rebbe and asked him what his purpose was in the Moshiach campaign. The Rebbe did not reply and shifted the conversation to other issues, among them a free-loan fund which the other rabbi managed. "Do you know so-and-so?" the Rebbe asked. "Would you give him a loan?" "Of course," the other rabbi answered. "I didn't know that he was suffering difficulty. I'd be happy to help him." "Would you extend the loan until Moshiach comes?" "My goal in the Moshiach campaign," the Rebbe continued, "is to eliminate this hesitation." By opening our eyes to the Messianic dynamics at work in our lives at present, our anticipation of Moshiach can be charged with the force of an idea whose time has come. Sichos Shabbos Parshas VaYeitzei, 5752 (1991), adapted in essay form in English, Sound the Great Shofar, p. 109ff. In particular, Sichos Shabbos Parshas Mishpatim, 5752 (1992), adapted in essay form in English, Sound the Great Shofar, p. 143ff. Millennium Lecture, Towards a Hunger-free Century, M.S. Swaminathan Foundation, Chennai (Madras), India, 29 April 1999. In "An Abiding Curiosity," Asian Business, Feb. 1997. Prepared by the Information Office of the State Council Of the People's Republic of China (November 1995, Beijing). See "The Chinese Army´s Conversion," by Tai Ming Cheung, Bonn International Center for Conversion, July, 1998. In his text, A Business and Its Beliefs. In In Search of Excellence. See Company Press Releases, April 10, 18, 2000. "Stockholding for the Masses: Better Than Good," by James K. Glassman, July 29, 1999. Glassman continues: "Is this a good thing? It is better than good. A society that accumulates wealth is a society secure enough to turn its attention to more important matters, like family, culture, art, learning and spirituality."